Energy Pack Premium is the full version of the free app by 3DM. 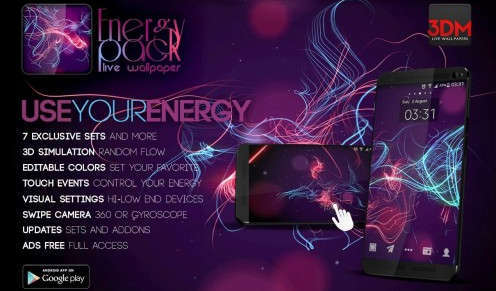 It's an amazing live wallpaper featuring beautiful 3D energy designs and animations. It packs over 12 Energy Scenes, and more than 12 New Bokeh types with full Colors, Effects & Camera control options. Change your boring Android homescreen and get something colorful! - New amazing scene - Ring Fight (energetic rings waiting for your touch). - New bokeh style - Radio Active (choose your own style). - Greatly improved sliders responsiveness! - Increased size of some controls. You can buy the app on Google Play if you got the cash.